Screenplay: S.E. Hinton, Francis Ford Coppola. Starring: Matt Dillon, Mickey Rourke, Nicolas Cage, Dennis Hopper, Diane Lane, Chris Penn, Laurence Fishburne, Diana Scarwid Vincent Spano, Glenn Withrow, Sofia Coppola, William Smith, Michael Higgins, Tracey Walter, S.E. Hinton, Tom Waits. Released back-to-back with his previous ‘teen-novel’ adaptation “The Outsiders“, Francis Ford Coppola attempted another of S.E. Hinton’s books. Like his previous release, he assembled a brilliant cast but approached it in a different style. This time, the results were far more impressive. Rusty James (Matt Dillon) is a troubled young man from a broken background. His mother left him years ago and his father (Dennis Hopper) has turned to alcohol. He’s the leader of a small gang in a time where gang fights are dying out and most people of his generation still idolise his absent older brother ‘The Motorcycle Boy’ (Mickey Rourke). Rusty James refuses to accept and believes he can make as much a name for himself as his legendary sibling. When his brother returns to town, the life that Rusty James envisioned begins to change. Admittedly, I never got around to reading the book on this one and given Coppola’s sumptuous visual take on it, I’m sure it would have made for an interesting comparison. Much like “The Outsiders“, this also has a feeling of a teenage audience at heart but is executed with much more darkness and depth. Coppola’s use of monochrome – with momentary flashes of vibrant technicolor – is simply astounding and quite beautiful to observe. Several scenes throughout the film border on surreal and dreamlike and the intense performances add to this; Matt Dillon is on great form as the tearaway teenager who can’t stay out of trouble and as his brother, Mickey Rourke delivers a character of quiet, tortured intensity. The rest of the cast are great also with Dennis Hopper playing the alcoholic father and Laurence Fishburne, Chris Penn and Nicolas Cage making up the rest of Rusty James’ crew. Added to which, there is a welcome cameo appearance by Tom Waits, mumbling his way through a short but memorable character. Coppola once described this film as “an art-film for teenagers” and coming from the man himself, there is no better description. It might have been experimental or ambitious for him at this time but it still stands as one of his most visually refined pieces of work. Special mention must also go to Stephen H. Burum for his ethereally stunning cinematography and Stewart Copeland (from the band “The Police“), for his unsettling and impressionistic score. This makes a perfectly dark companion piece to the lighter side of “The Outsiders“. They couldn’t have been shot any more different and if viewed together, would make a great double bill. Screenplay: Kathleen Rowell, Francis Ford Coppola. Starring: C. Thomas Howell, Matt Dillon, Ralph Macchio, Patrick Swayze, Tom Cruise, Rob Lowe, Emilio Estevez, Diane Lane, Leif Garrett, Darren Dalton, Glenn Withrow, Gailard Sartain, William Smith, Sofia Coppola, S.E. Hinton, Tom Waits. After “One From The Heart” in 1982 and his subsequent bankruptcy following that film’s spiralling production costs, director Francis Ford Coppola turned his hand to a couple of adaptations of ‘teen-novels’ by S.E. Hinton. 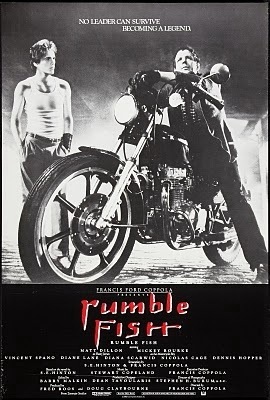 This was the first (followed by “Rumble Fish“) and although it doesn’t quite hold up today, it still shows how Coppola had an eye for acting ensembles. 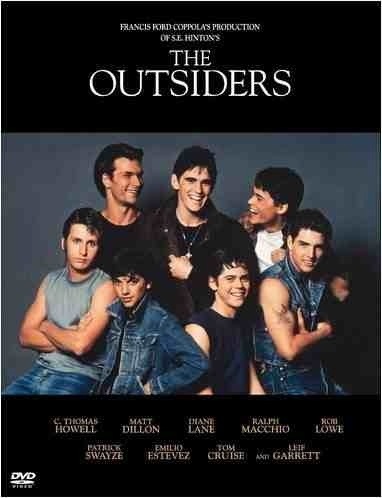 In 1960’s Oklahoma, 14 year old Ponyboy Curtis (C. Thomas Howell) is part of a gang known as “The Greasers”. At heart though, he has an interest in poetry and “Gone With The Wind” and believes in a better life. However, one evening him and his friend Johnny Cade (Ralph Macchio) are attacked by rival gang “The Socs”. In defence, Johnny is forced to kill one of them and with the help of Dallas Winston (Matt Dillon), they go on the run. While away though, the tension mounts between the two rival gangs. I remember reading S.E. Hinton’s book in school when I was about 13 years old and as much as I loved it then, it is ultimately a sentimental and romanticised view of adolescence. Upon reflection, there are several cringe-worthy moments and Coppola approaches the material with such a melodramatic and unashamed style. In fairness though, he sticks very closely to Hinton’s novel (which she wrote when she was 15) and I don’t suppose it was meant to appeal to anyone other than those harbouring their teenage angst. It’s just a shame, that with such potential, the director of “The Godfather” couldn’t have dropped some of the self-indulgent innocence and added a little more bite. However, it doesn’t proclaim to be anything other than what it is and it’s target audience should still find plenty to enjoy. I know I did – 20 years ago. A lot of scenes still retain a certain power and the music score by Carmine Coppola compliments it well. As does, the use of Stevie Wonder’s marvellous song “Stay Gold“. The most impressive thing about it though, is the ensemble of young actors that Coppola managed to assemble. A lot of them went on to bigger and better things while some crashed and burned but at the very least, it was a cast of familiar faces that were at the forefront of many successful movies of the 80’s and 90’s. Coppola released a director’s cut in 2005 that restored almost half an hour of footage. I haven’t seen that cut and whether or not it improves the film remains to be seen but I would be interested in viewing it nonetheless. As a big fan of the novel in my youth, this is a bit of a guilty pleasure for me. Coppola portrays the characters and sets the scenes with admiration but now that time has passed and my critical faculties have developed, there’s no doubt that youth and idealism played a part in my, more favourable, opinion back then. Screenplay: Sergio Leone, Leonardo Benvenuti, Piero De Bernardi, Enrico Medioli, Franco Arcalli, Franco Ferrini. Starring: Robert DeNiro, James Woods, Elizabeth McGovern, Tuesday Weld, William Forsythe, James Hayden, Joe Pesci, Burt Young, Danny Aiello, Treat Williams, Larry Rapp, James Russo, Scott Tiler, Rusty Jacobs, Brian Bloom, Adrian Curran, Mike Monetti, Noah Moazezi, Jennifer Connelly. Numerous excellent crime sagas have been made over the years and at the top of most peoples lists tend to be “The Godfather parts I & II”, “Goodfellas” and some would even have “Scarface”. Although these are superb inclusions in the genre, this Sergio Leone masterpiece is the definitive and the real classic of them all. Based on the novel “The Hoods” by Harry Grey we are manificently told the story of David ‘Noodles’ Aaronson (Robert DeNiro) who, after several decades away, returns back to the lower east side of New York city where he grew up with his friends and became prominently involved in a Jewish life of crime. Having loved and lost throughout his time here, he reflects on what was a tumultuous time in his childhood (and young adulthood) and now in his twilight years, longs for answers to a fatal double-cross. Leone is better known for his spaghetti westerns and brings that same style from the dry barren western plains to the sprawling city of New York. Along with him, is composer Ennio Morricone and his idiosyncratic and masterful musical style. When these two combine their talents you know you’re about to be treated to a wonderful storytelling experience. Just for good measure, throw in the iconic and most prodigious of screen actors in Robert DeNiro and what you have is a work of art. An absolute masterpiece of cinema. A multi-layerd epic that has such depth that it’s yet to be matched. “The Godfather” saga has a similiar magnitude but only over three films. Leone manages to condence his elaborate tale in just under 4 hours. However, the original U.S. release was cut by 88mins, ceasing to make sense, with characters appearing and disappearing suddenly. This would explain why it didn’t fare so well and shockingly wasn’t even acknowledged for any awards. 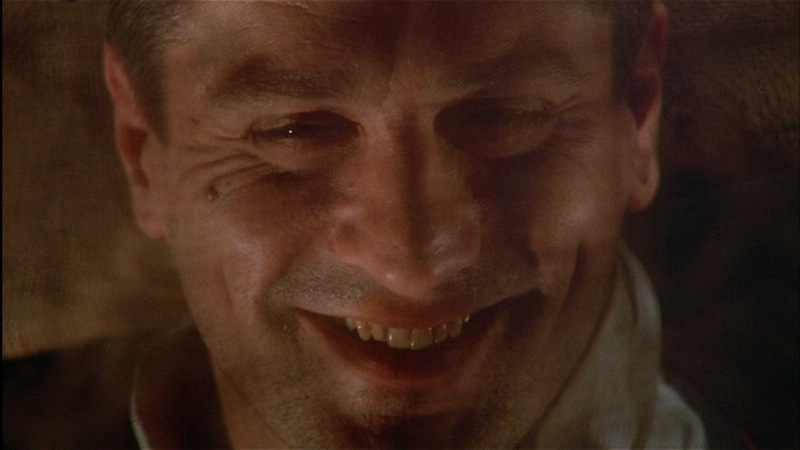 Although compellingly acted by DeNiro, this doesn’t stand as his finest performance, but it certainly stands as his finest film and it’s by far the best work that James Woods has delivered, as well as the impressive supporting cast of Tuesday Weld, Treat Williams, Joe Pesci and Jennifer Connelly is her film debut. 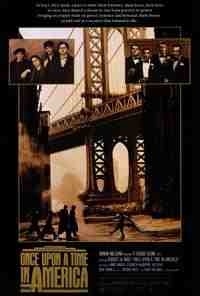 It’s all down to the excellence of Leone though and his stylish homage to the gangster film. It’s long, it’s engrossing and once all the pieces begin to fit together it’s a quite heartbreaking story in it’s telling. With it gorgeous art direction by Carlo Simi, it’s heartwrenching soundtrack by Ennio Morricone and the magnitude of Sergio Leone’s vision, it’s one of the best films ever made. Sadly it was Leone’s last but a virtuosa one to go out on. 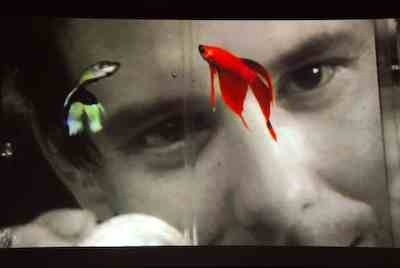 Included in My Top Ten films.